Doug Ulman and his mother Diana wrote this guidebook as a resource for young adults dealing with cancer, from the initial diagnosis through long-term survivorship. No Way provides information pertaining to how young adults and their family and friends affected by cancer can face the challenges that lie ahead. It offers practical information in the areas of medical care, education, relationships, emotional challenges, health and wellness, survivorship, and many others relevant to the young adult cancer experience. No Way also provides usable and practical tools to help young adults and their families keep detailed records and documentation of their cancer treatment. 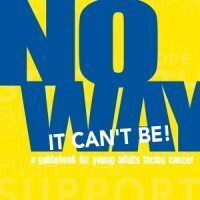 Originally written in 1997, No Way was revised in 2015 to provide updated resources, information and perspectives for young adults and their family and friends.